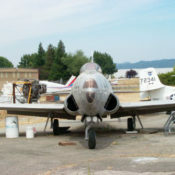 PCAM's F-8U Crusader is well-known to San Francisco residents as the "Plane in the Park". For many years after her service career she was a climb-aboard prop at Larsen Playground on 19th Avenue. 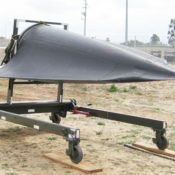 In PCAM's early years, San Francisco disposed of the dilapidated old airframe and PCAM gladly took it on. Badly abused and damaged, PCAM has been continually improving, restoring, and repainting her. The F-8U Crusader had a unique variable incidence wing which could be tilted up, as shown in this photo. This allowed slower landing speeds and better visibility for the pilot during the always-challenging carrier landings. 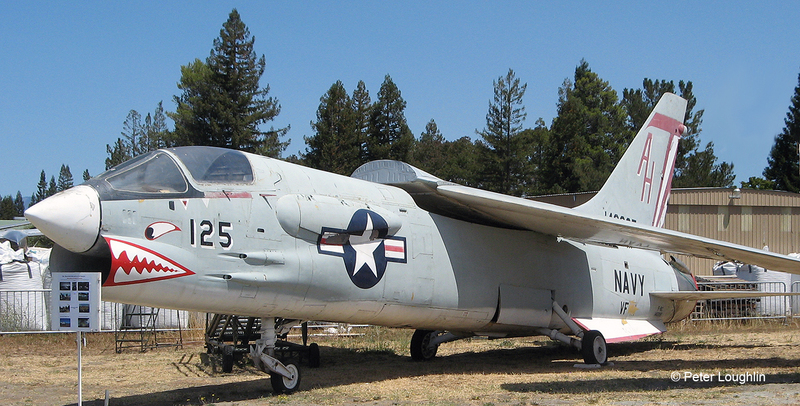 Pacific Coast Air Museum’s F-8C Vought Crusader was the “plane in the park” on 19th Ave in San Francisco for 20 years. 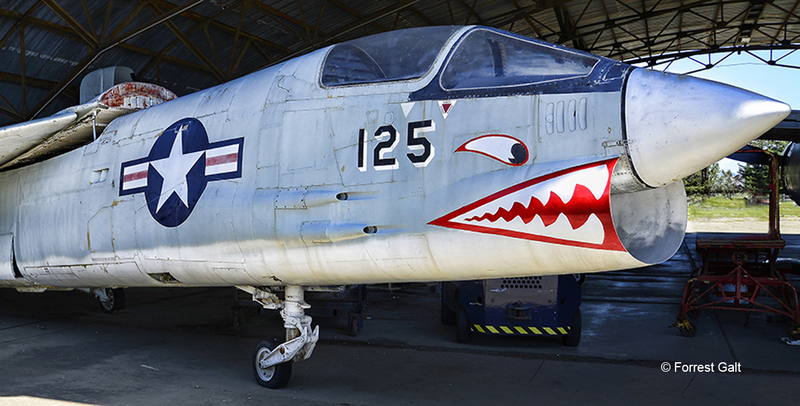 After service time with the Navy and Marines, the plane was retired as a “playground toy.” After 20 years, the city of San Francisco wanted to remove the plane due to its bad condition and lead-base paint. It was an eyesore to the neighborhood as it was covered with graffiti. 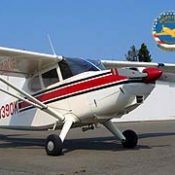 Pacific Coast Air Museum’s recovery team went to San Francisco, dismantled the aircraft and brought it back to Sonoma county in 1993. This aircraft has been undergoing external restoration, with all paint removed and surfaces restored. Parts were recovered from “the bone yard” at Davis-Monthan Air Force base, for this exterior restoration. During the Pacific Coast Air Museum Open House in 1994, the F-8C rolled on its wheels for the first time in 20 years. Many people at the airport came out to watch it roll down the taxi way. Today, the static restoration of the Crusader has been completed and the F-8C sits proudly on display along with Pacific Coast Air Museum’s other historic aircraft. 600 mile (966 km) combat radius. One 18,000 lb (8,165kg) afterburning thrust Pratt & Whitney J57-P20 turbojet. Fixed: Four Colt-Browning M39 20mm cannons with 144 rounds per gun in the forward fuselage. Disposable: This is carried on the fuselage sides (four AIM-9 Sidewinder air-to-air missiles or eight 5 in (127 mm) rockets) and on two underwing hardpoints, up to a maximum weight of 5,000 lb (2,268 kg). Typical underwing loads are two Mk 84 2,000 lb (907 kg) bombs, or two Mk 83 1,000 lb (454 kg) bombs, or four Mk82 500 lb (227 kg) bombs, or 12 Mk 81 (250 lb (113 kg) bombs, or 24 5 in (127 mm) rockets; the French F-8E(FN) version carries two Matra R.530 air-to-air missiles on the sides of the fuselage. Communication and navigation equipment, plus AN/APQ-94 search and fire-control radar and other systems.